1980s fish earrings from op shop, Ken Done Canteen scarf, Esprit singlet, vintage Laura Ashley jumpsuit, vintage silk tie belt, Ken Done tote donated by Susan, Fluevog samples (from Sole Devotion). 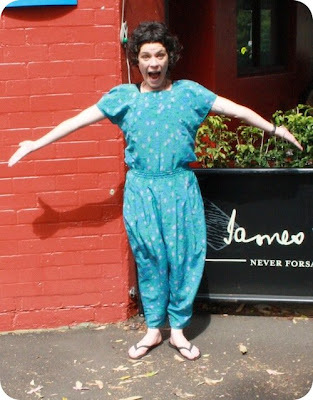 Top story: I love jumpsuits! News feature: Look closely at how well matched my Ken Done Canteen scarf is to my vintage onesie. 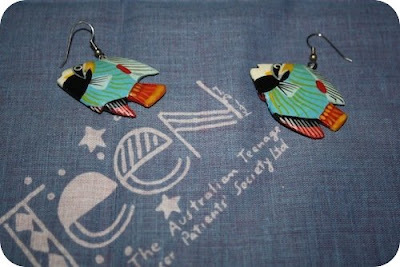 I also took the time to match the look with decorative 1980s fish earrings. Classy! Financial Insight: You can now donate money using PayPal. If you already use PayPal for eBay, this is as simple as a few clicks. Remember, every dollar goes directly to supporting the young people accessing The Social Studio. And it's a tax deduction. *good* news for all! Photos: I've updated the Quick Look Book. Love to hear what you think. Looks like this week's theme is onsies or jumpsuits. That is not a bad thing. 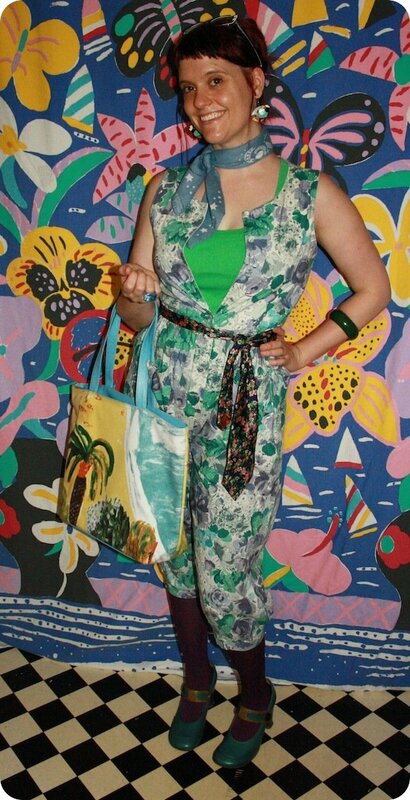 I can never get enough jumpsuits. i just checked the quick look book thingo again too. its great to sit back and watch all that Done coming at you for 3minutes.have you thought about doing a favourite outfit poll? 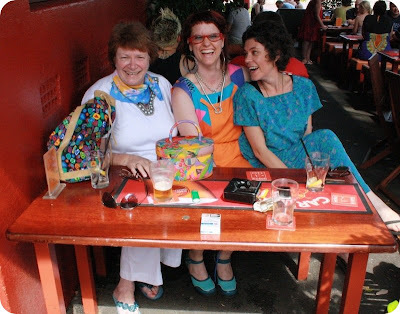 oh what a fun afternoon that was! I'm off to search some more shops this week for even more KD, hopefully!